At Park Terrace Health Campus, we take pride in knowing Louisville like the back of our hand. We can tell you the best places to eat, which parks have the best views, and what stores have the best deals. But more important than that, we can tell you the stories of the people who live here. The seniors who call our campus home bring with them a lifetime of experiences, many of which have taken place right here in Louisville, KY. When we’re together in our dining room, or in front of the fire, or outside in our courtyard, we listen to these experiences, and we learn. That’s why we recognize the grandkids that pay us visits, why we remember anniversaries and birthdays, and why our activities aren’t just fun – they’re meaningful. To put it simply, at Park Terrace Health Campus, we’re family. We built Park Terrace Health Campus on a foundation of family values: compassion, honesty, respect, and above all, service to others. For over 20 years, we’ve been connecting with people across the Midwest who share these values. Many of them have become Trilogy employees, and many more have become valued residents. We take pride in treating all of them like family. 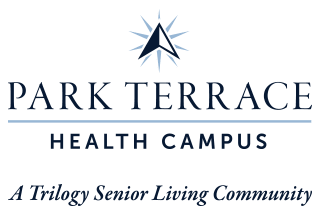 When you choose a Trilogy Senior Living Community, you can count on us to serve you according to our values, and to uphold those values with standards you can depend on. That’s The Trilogy Difference. You’ll feel it the moment you walk through our doors, and you’ll see it everywhere you look. It’s what makes every Trilogy Senior Living community a choice you can be proud of. Our family can’t wait to meet your family. Schedule your tour today.